It's hard to believe that this is the last week of this series! I hope you are loving it has much as I have been. These gals are so creative and inspiring! At the bottom of this post is a "mini-gallery" with the links to all of the projects. I hope you'll check it out! We all love a good snack, don't we? Well, this Gingerbread Caramel Popcorn is definitely one of my favorites! It's a great gift to give around Christmas time, too. I love to gift it because this time of year it seems everyone is giving cookies, and while I LOVE cookies, you have to give them and eat them right away. But with popcorn, it will stay fresh for days, if not weeks and people don't feel that they have to eat it right now in order to enjoy it. 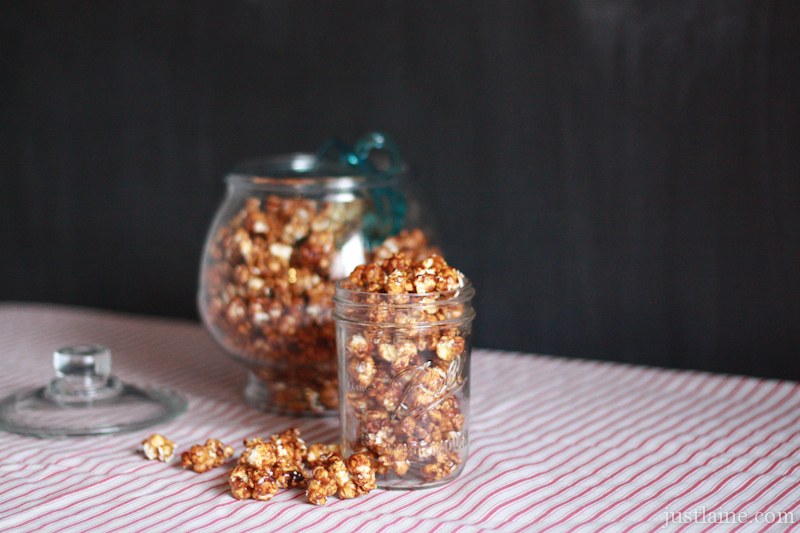 Want to know the best part about this popcorn? It uses just a few ingredients you most likely have on hand, doesn't have corn syrup, and you DON'T have to babysit it. I hate recipes that you have to babysit. And by that I mean the kind where you have to open the oven and stir it every 10 minutes. Yeah, I avoid those. At all costs. (Kind of hazardous when you have little people around if you ask me!) So I experimented a little and made this just like I make my Simple Granola. I went to bed and forgot about it. 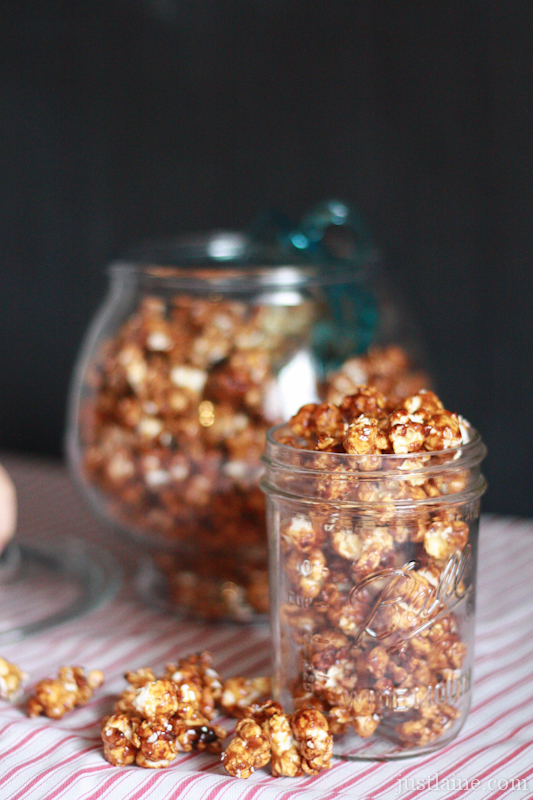 Woke up to a marvelous smelling kitchen and a perfect batch of Gingerbread Caramel Corn. Easy peasy. This recipe uses air popped popcorn (I pop mine in something similar to this that I found for $0.25 at a yard sale), but you could also pop it on the stove using this method. 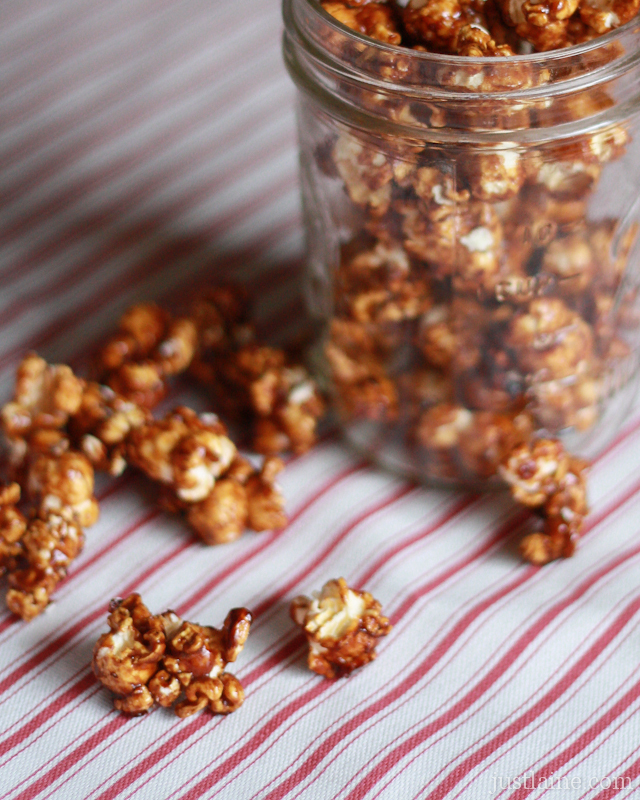 Each 1/2 cup of unpopped popcorn kernels should equal about 12 cups of popped. 1) Separate popcorn into two large bowls coated with cooking spray. Set aside. 2) Butter the sides of a small, heavy sauce pan. Add brown sugar, butter, honey, molasses, ginger, cinnamon and salt. Bring to a boil over medium heat, stirring constantly. Boil without stirring for five minutes. 3) Remove from heat and stir in baking soda and vanilla. 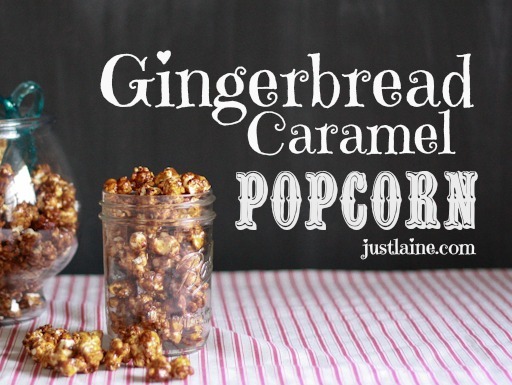 (It will foam) Quickly ladle over popcorn and mix well. 5) Bake at 300 degrees for 10 minutes. Remove pans from oven and stir well, mixing and turning the popcorn with a spatula. Return pans to the oven. (Put the pans that were on the bottom rack on the top.) Bake for 5 more minutes and stir again. Return pans to the oven, rotating placement once again. Close the oven door, turn the oven off and go to bed! =) If you don't want to make this at night, just let it sit in the oven for 4-5 hours, basically until the oven and popcorn are cooled. 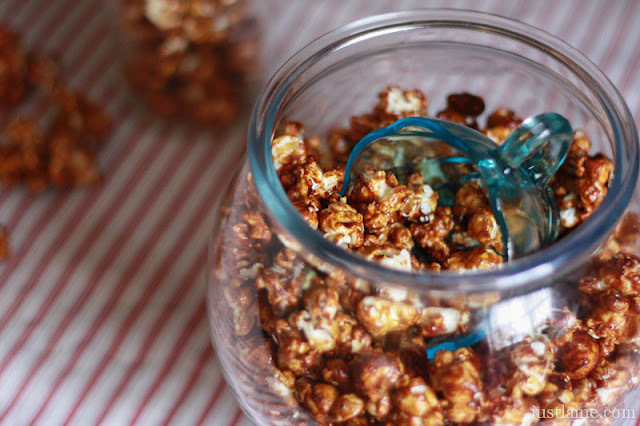 Are you a caramel popcorn lover? Do you have any favorite treats you love to gift? 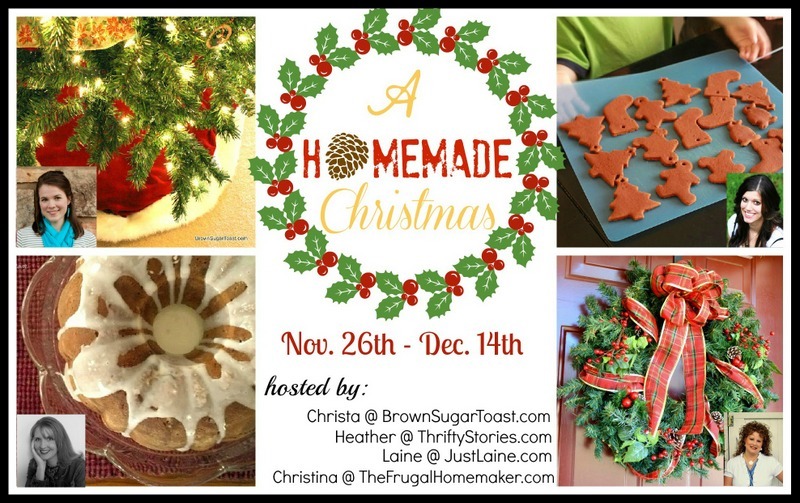 oh, Laine, this looks and sounds simply scrumptious! thanks for the recipe! and your food photography is gorgeous. love the styling! Aww, thanks Christa! The weather was not cooperating with me (cloudy out, boo!) and I had a 10 minute window to get it done so I'm thankful they turned out at all! Hope you enjoy it, it is super yummy! Laine, you just saved me... seriously. What I had planned to do as gifts was going to take too long, I can't find containers, etc. so this is my new gift :) Do you suggest putting it in paper bags to gift? also do you know of another flavor - like a savory recipe? I put mine in those clear/printed treat bags from Hobby Lobby. They are usually always 50% off right now so it's $1 for 20 of them. As far as a savory recipe goes, I make parmesan and garlic kind a lot for snack at home. You just pop your popcorn, pour melted butter on it and then mix some parmesan cheese, garlic powder and salt together and sprinkle it on. It's so yummy! We always eat it right away so I don't know how well this would keep.